Wow. They made Salinas this evening. The trucks almost didn't. More red tape and paperwork. I said in the very first blog post that 'we'd be the scissors and we'd cut through the red tape and say Luftschiff Hoch'. I smile when I write that. I think I knew we would find a way to do it, and now its almost here, well, I'm not quite sure what I feel. Slightly giddy, but that might be lack of sleep over the past couple of weeks. Almost too excited to sleep, like I used to feel before a big exam, or, when I was little, the night before Christmas. I feel on the edge of tears, but I can't tell if its exhaustion, frustration at the amount still left to do before I can hit the sack tonight, or simply pure joy. I think tomorrow it will be joy. 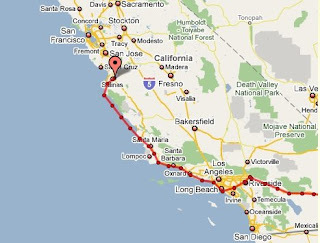 Tomorrow I have to get up early and grab transportation to Salinas (thanks Mosaic!) so that I can join the flight in. This is my treat, my few hours of peace and quiet and solitude with my nearest and dearest and just a few team members as we bring our ship to its new, and hopefully welcoming, home. I've missed Brian (he is my husband after all!) and our contact over the last two weeks has been late night phone calls analyzing challenges there and in the office. Did I tell you we've been moving offices too and dealing with moving phones, IT etc? There are some stories and heroes there that I need to acknowledge in posts sometime soon. It's been very hard to see the team on the road, being such total stars, problem solving and making it happen and not be with them to share the pain and triumphs. But we've had more than our fair share of it back at base too, and the spirit and endless hours put in there too has been awesome. Tomorrow will be the first time that all the Airship Ventures team are together in one place - pilots, ground crew, engineers, passenger handling, marketing, sales, administration, finance, facilities, operations etc. And that's going to feel really really great.